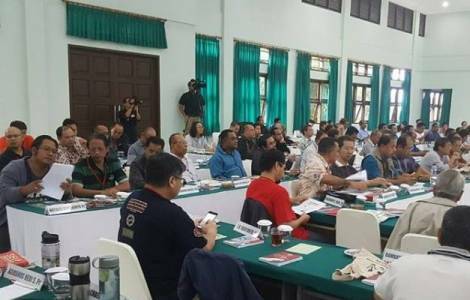 ASIA/INDONESIA - For the Church of Jakarta 2019 is "the Year of wisdom"
Jakarta (Agenzia Fides) - The Archdiocese of Jakarta officially declares that 2019 will be "The Year of Wisdom". As Agenzia Fides learns, the pastoral focus will be directed above all to social issues and how to face them and live them with the Gospel spirit, according to the message of Christ. Solemnly announcing 2019 the "Year of Wisdom", Archbishop Ignazio Suharyo invited two important Catholic figures to speak during a pastoral event held in Jakarta on January 5: the Jesuit and professor of philosophy Fr. Franco Magnis-Suseno and economics professor Rhenald Kasali, lecturer at the University of Indonesia. Hundreds of Catholics from the 67 parishes of the Archdiocese of Jakarta participated in the event, paying attention to the fact that 2019 will be, among other things, marked by the presidential and parliamentary elections scheduled for next April. In the last four years, the Archbishop of Jakarta has tried to include, in the pastoral plan of the local Church, a reflection on the philosophical values of the "Pancasila", the "Charter of the five principles" at the base of the Republic of Indonesia. This urgency, felt by the Catholic Church and other organizations of civil society, stems from the lack of knowledge of the Pancasila noticed in recent years by many Indonesians. For this reason, in a five-year plan, "every year we adopt a principle of the Pancasila and insert it in the pastoral vision, trying to reflect and contribute to the common good of the nation", explains Archbishop Suharyo to Fides. In the Year of Wisdom, we refer to the 4th principle of Pancasila: "Democracy guided by inner wisdom, which springs from deliberations among the representatives". Among the key points that emerged in the meeting on January 5 is that of the "primacy of conscience", in every good Catholic: "The Catholic Church has never given instructions to elect a certain figure or vote for a given party. Only an illuminated conscience can lead to a wise choice", explained Jesuit Fr. Suseno, who teaches at the Driyarkara High School of Philosophy. "Our common enemy is rampant corruption", he added. Archbishop Suharyo had the opportunity to present the figure of Pope Francis as "a man of prayer and compassion, who shows love and humility", noting that this attitude can be a good model for "a leader who wants to serve people in the nation". "What makes leadership meaningful is its ability to transform", he observed.